We at M44 Building Company recognize the huge growth in the equestrian industry, particularly in Canada, where there has been tremendous growth in horse ownership and in the economic contribution from the equine industry over the past decade or so. This translates into greater demand for riding lessons and training facilities and increased interest in horse shows and competition. Our knowledgeable team, backed by more than 15 years of experience in the pre-fabricated metal building industry, can help you design the perfect horse arena, with or without living quarters to suit your needs and budget. Our consultants will work with you to plan an interior space that is well-lit and airy and the right size so that horses don’t get spooked. Your arena will be assembled by a highly-trained crew from high-quality pre-fabricated components that M44 Building Company sources from suppliers in Canada and the United States. 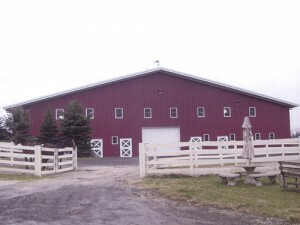 You will have a structurally-sound arena that will protect horses and riders from the elements for years to come. We can also provide you with all kinds of options to make your arena more special, such as kickboards, special material under the roof to prevent condensation from falling as “indoor-rain”, various types of doors, etc.